Discovering truffles is extremely complicated not just because its a seasonal treasure but because are hidden into soil. The truffle hunter needs a dog with a fine sense of smell to recognize the aroma of this special mushroom also known as “black gold” of foods for its rarity. The spores of truffles are spread by boars and other wild animals, glutton for this smelly treasure. We had the occasion to buy some black truffles at the 32nd National Fair of Truffles in Sant’Agata Feltria (Rn), Italy. We bought these on a local temporary market from Sant’Agata Feltria Tartufi. In a large pan brown a chopped red onion with butter and extra virgin olive oil. Toast rice for a few minutes and add a glass of white wine to deglaze rice. When all the wine is evaporated start adding hot vegetable broth you are letting boil apart in another pot. Add broth anytime the rice start being dried, you will notice it will release starch and the risotto becomes creamy. Carnaroli rice requires from 16 to 20 mins to be ready. Two minutes before the rice is cooked, melt butter in a small pot on low heat and add the majority of flaked truffles. Make sure you removed all the soil from the truffles – see the guide below on how properly clean truffles. To reduce these in flakes use the appropriate tool or if you do not have it, just help yourself with a potato peeler or a sharp knife. 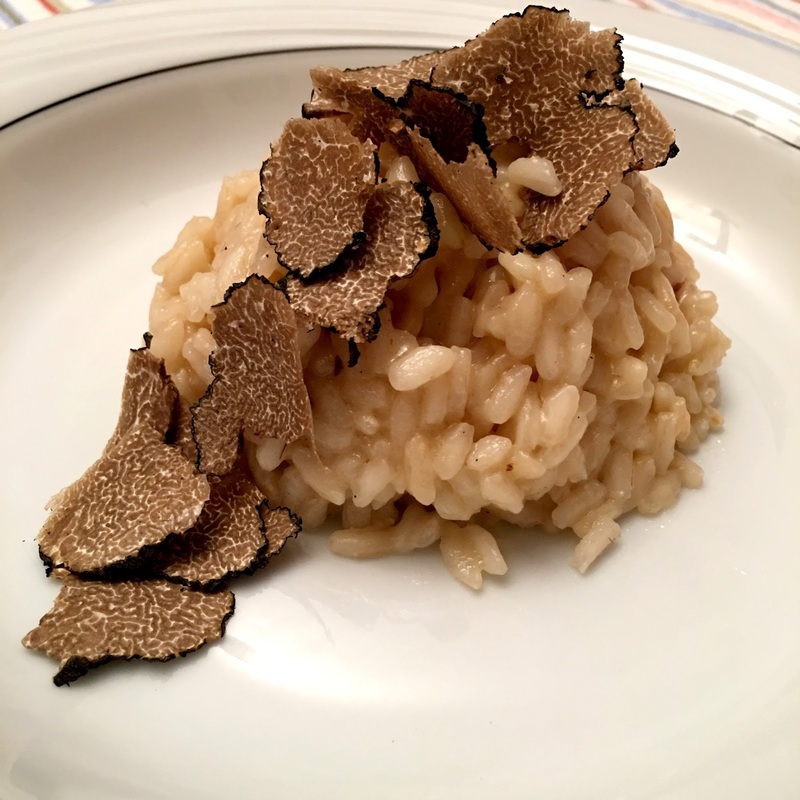 To stir rice (in Italian, we use a proper word to explain how to complete rice cooking: “mantecare”, which means “cook until creamy”) add the cream of butter flavored with truffles and sprinkle with a lot of Parmesan cheese. Shake the pot to have the traditional wave and mix all the ingredients. Maintain the risotto firm to taste as well when you switch off the fire the rice will continue to cook. Truffles are also really delicate. As soon as we buy them we must put in a glass jar with blotting paper and change it every 2/3 days to properly maintain the taste and avoid mold, do not preserve for more then a week. Before eating we must remove all the soil helped by a soft brush, to simplify the process soak the truffle in a bowl with water but remember it is like a sponge so we must dry it immediately with a bit of paper or a cloth and brush it again until clean.